Back to reality today. We had a long weekend in Perth for the Queens birthday (it was not really her birthday on the weekend). Seeing we had visitors from North America, we figured the best thing to do was spend it at the beach! My folks have a place on the beach used for holiday rentals, and luckily we had a chance to live it up large. It was perfect weather, the water could have been a little warmer. Reading, bbqs, embroidery, many games of Uno, catching up with family and friends, and walks and kayaking around the place. This is the view from the top balcony, you pretty much can't beat that. What an awesome weekend! 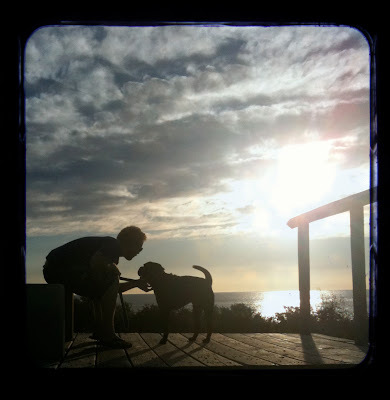 This is a TTV (through the viewfinder) pic I made of Joel and Angus enjoying some quality time, watching the sun setting over the Indian ocean! Who is the Angry Little Man?